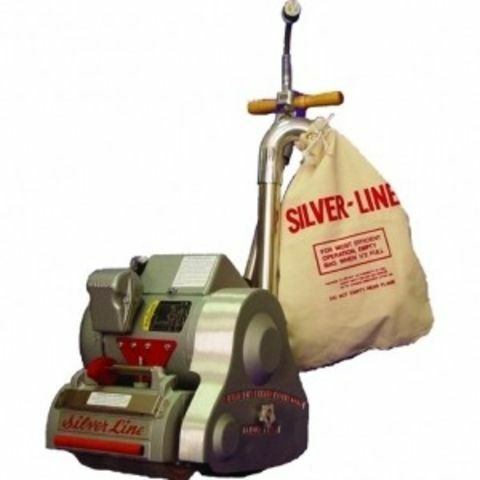 When doing a full renovation of your hardwood floors, you'll may use as many as four different rental sanders, each with a very specific purpose -- and chances are you'll begin with is the Essex Silverline SL-8, the go-to drum sander for the equipment rental industry.This unit has the power to tackle the worst in hardwood floors, re-leveling cupped, bowed or damaged floor boards. Drum sander rentals also are commonly used when a hardwood floor has been buried under decades of hard finishes and wax that are too much for an orbital sander to handle.If the going is tough, but this machine is more than up to the task. In fact, the biggest challenge in using the drum sander is to manage that power and it's abrasive force.In fact, that's one reason this particular model is a great choice for DIY'ers, with a single, slow operating speed, which reduces the likelihood that you'll cut a long gouge in the hardwood surface. Why would I use a drum sander as opposed to an orbital sander to re-do my hardwood floor? A drum sander has the power to cut through heavy finish layers, and can actually level a floor surface. Generally, orbital sanders apply about one-tenth the sanding pressure as a drum sander and are used for lighter work. Do I need to use sandpaper with this machine to refinish my hardwood floor? Yes, you use varying grit paper depending on the job as you go from rough work to finer sanding Generally, you'll use a 20 grit for rough sanding; 36 - 40 grit for second sanding; 60 grit for a third pass; and 80 - 100 grit for final sanding. How do I know what sandpaper grit to use? If you're refinishing your floor, you'l progress through a variety of grits from 20 grit for the heavy work, to 100 grit for removing fine scratches before you finish the floor. How long does each sheet of sandpaper last? Generally speaking, if you're using the right grit for the conditions, a single sheet of drum sander sandpaper is good for about 250 square feet of hardwood floor surface. Clear the room of all furniture, and remove or countersink tacks and nails that rise above the hardwood floor surface. A warning -- protruding nails will at best tear up your sandpaper, and at worst can damage the sander drum -- which could result in an unwanted damage charge upon return to the equipment rental shop. Countersink nail heads about a quarter-inch below the wood surface. Dust from a floor refinish can be an insidious foe -- take the time to tightly mask off any doorways or hall openings entering your work area with visqueen plastic -- otherwise you can expect to find dust all around the house for weeks! Get out the tape measure -- from the number of sheets of sandpaper you'll need to use to the gallons of finish you'll be applying. DO: Although drum sanders do have a dust-catching bag,there's no way around it -- this is a dusty job. Get a packet of particle masks.